birthday dessert ideas: Pasta Bar Veneto rolls out new dishes.. When you think of something or someone, it is true that you end up seeing them often or that thing everywhere you go. Similarly, I haven’t been to Pasta Bar Veneto in ages, the 1stvisit was years ago and in Alsa Mall. And then a brief visit to their outlet in Pondy. 2 weeks got the opportunity to visit the outlet in Burkitt Road. Who would have thought I would be back there once again. Yes it happened last evening! Unlike earlier, these days I don’t mind going anywhere. Most places are a hop skip or jump away. It took me just about 12 mins to reach Burkitt Road from home and I was there before 7.30pm. Spotted the gang, said Hi hello, and everything else and we took a booth on the right side of the restaurant. We were greeted and shown the menu, including the new dishes that had been recently included. An interesting thing about the menu card here is that all the dishes have a code next to them. Such a blessing, as it makes it easy for people who have difficulty in pronouncing the names to order. I shall take the G9 or E17 and your dish arrives with no confusion!! We started the evening by ordering a few beverages. Hot chocolate, fresh lime soda salt [my standard order] and Green apple mojito. The hot chocolate came in the most gorgeous mugs and looked yumm.. I slurped my lime soda with glee and the mojito was also good [tad sweet for my liking]. With a little one to keep us smiling, we started the evening on a high note. While we flipped through the menu, our eyes locked at the Zuppa section [Soups]especially the Zuppa di Arachidi Zucca [pumpkin soup] [C3], and the other option was Zuppa di pollo [chicken soup] [C5]. 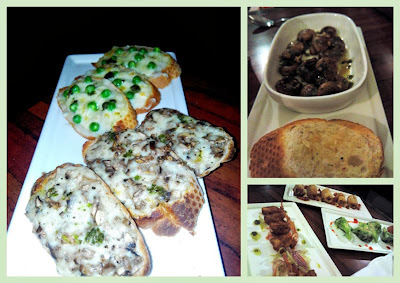 I loved the pumpkin soup, but felt it was a tad salty [probably cos of the herbs that were sprinkled on top which had a bit of salt in them]..
Moving on, for starters we were served a crostini platter- two kinds- one with peas & potato[A4] and other had mushrooms & cheese[A5]. The former was a tad mushy and bland while later was good. We also tried their other mushroom starter- Funghi Saltati con pesto [ mushrooms tossed in garlic and cooked with pesto]-[A8], the pesto was very subtle in this, but being a mushroom freak, I loved it. And then came the plates filled with more starters, 2 non veg and one more veg.. The veg was Brocolli and cheese grill [A9] which was yumm, the broccoli had been cooked just right. The non veg eaters had fish fingers[A14], pigs in a blanket except here it was chicken[A12] and prawns batter fried. Amidst the food, we also chatted with the manager about the new dishes and asked him for recco for the main course. After much deliberation, we decided to go with 4 different dishes.. 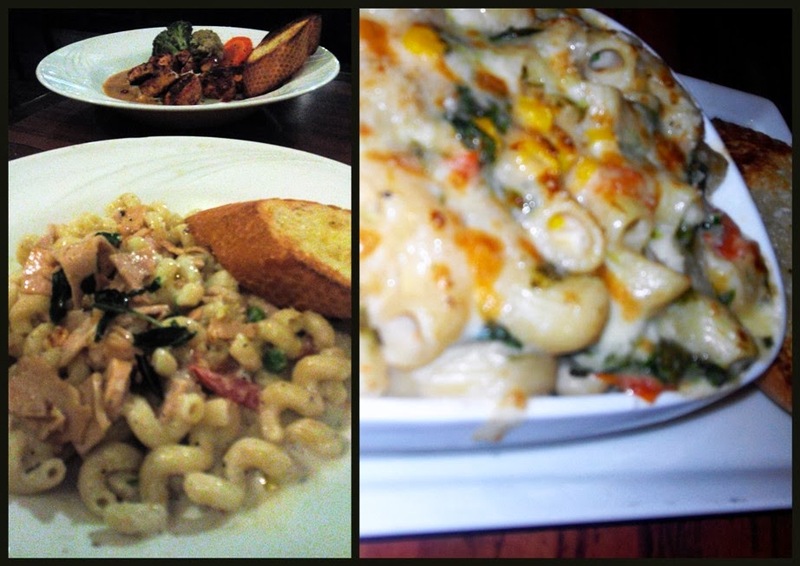 I chose the Macaroni & Corn bake [D4], which was served alongside a slice of bread and it was quite good. It is quite a large portion and filled with corn and spinach as well, a tinge of red chilli that added to the flavours. The others went for non veg dishes- Panna con prosccuitto di pollo e piselli [Cavatappi pasta[longer twisted version of macaroni]cooked with chicken ham and chicken sausages in white sauce], Salsa rosso con pollo e funghi[E19]- grilled chicken, red paprika and mushroom that had been tossed in peri peri spicy sauce which was ordered with fettucini pasta and finally, the Involtini di pollo ripieno [F3] which was stuffed chicken breast on a thick tomato creamy sauce served with a side of grilled veggies. The main dishes were good…. Before we knew it, time had flown by and it was nearly 9.30. 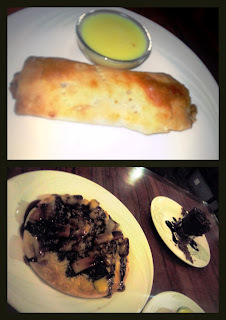 We quickly ordered desserts- I chose the Apple Strudel with vanilla cream [I14], the others chosen were Mud pie [I6], Pizza dolce [ fruit pizza] [I2] and Poached pear in berry soup [I5]. Loved mine and the poached pear the best. The pizza was alright, dint like the texture and thickness of the sweet focaccia bread and the mud pie was confusing. And with that the evening was done!! We had a good time needless to say- good company, good ambiance, amazing music [yes i knew most of the songs J] and good food..